Above Nirn there are two moons: Masser, also known as Jode or Mara's Tear; and Secunda, also known as Jone or Stendarr's Sorrow. Masser is the larger of the two, well over twice as large by appearance. 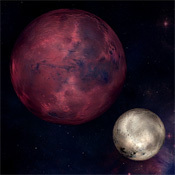 Since Secunda is sometimes seen to transit Masser, it is clear that Masser is indeed larger, not closer.Note 1 In Khajiiti legend, the motion of the moons constructs something called the "Lunar Lattice", which protects Mundus from the rest of Aetherius. Khajiit are born in differing forms depending on the current phases of the moons. See Khajiiti Morphology for details. There are thirteen named constellations in the sky. There are three Guardian signs; The Warrior, The Mage, and The Thief, each of which protects three charges. Each of these twelve signs corresponds to one of the twelve months in the Tamrielic year. The thirteenth sign, The Serpent, has no guardian or month and moves around the sky, usually threatening the other signs. The Firmament provides descriptions of all of the constellations, as quoted in the following sections. In 2E 582, three Guardian signs — the Warrior, the Mage, and the Thief — fell from the sky and took on a mortal form known as Celestials. The Dwemer have symbols for these constellations, which (except for The Serpent) correspond to letters in the Dwemer Alphabet. The Apprentice's Season is Sun's Height. Those born under the sign of the apprentice have a special affinity for magick of all kinds, but are more vulnerable to magick as well. The Atronach (often called the Golem) is one of the Mage's Charges. Its season is Sun's Dusk. Those born under this sign are natural sorcerers with deep reserves of magicka, but they cannot generate magicka of their own. The Lady is one of the Warrior's Charges and her Season is Heartfire. Those born under the sign of the Lady are kind and tolerant. The Lord's Season is First Seed and he oversees all of Tamriel during the planting. Those born under the sign of the Lord are stronger and healthier than those born under other signs. The Lover is one of the Thief's Charges and her season is Sun's Dawn. Those born under the sign of the Lover are graceful and passionate. The Mage is a Guardian Constellation whose Season is Rain's Hand when magicka was first used by men. His Charges are the Apprentice, the Golem, and the Ritual. Those born under the Mage have more magicka and talent for all kinds of spellcasting, but are often arrogant and absent-minded. The Ritual is one of the Mage's Charges and its Season is Morning Star. Those born under this sign have a variety of abilities depending on the aspects of the moons and the Divines. The Serpent wanders about in the sky and has no Season, though its motions are predictable to a degree. No characteristics are common to all who are born under the sign of the Serpent. Those born under this sign are the most blessed and the most cursed. Alone of the constellations it is said to be formed of Unstars, rather than stars and planets. [UOL 1] The Serpent symbol is not shown in the Imperial Orrery. The Shadow's Season is Second Seed. The Shadow grants those born under the sign the ability to hide in shadows. The Steed is one of the Warrior's Charges, and its Season is Mid Year. Those born under the sign of the Steed are impatient and always hurrying from one place to another. The Thief is the last Guardian Constellation, and its Season is the darkest month of Evening Star. Its Charges are the Lover, the Shadow, and the Tower. Those born under the sign of the Thief are not typically thieves, though they take risks more often and only rarely come to harm. They will run out of luck eventually, however, and rarely live as long as those born under other signs. The Tower is one of the Thief's Charges and its Season is Frostfall. Those born under the sign of the Tower have a knack for finding gold and can open locks of all kinds. The Warrior is the first Guardian Constellation and he protects his charges during their Seasons. The Warrior's own season is Last Seed when his Strength is needed for the harvest. His Charges are the Lady, the Steed, and the Lord. Those born under the sign of the Warrior are skilled with weapons of all kinds, but prone to short tempers. Many cultures follow the passage of the stars. Undoubtedly the most advanced knowledge of the heavens comes via the relics of the Dwemer. Of particular importance is the Orrery found in the Arcane University at the Imperial City in Cyrodiil which shows all the various planets and can even draw upon the power of Nirn's twin moons. 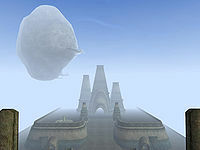 A second place of importance is upon the island of Stros M'Kai where a Dwemer observatory lies. This observatory contains an orrery as well and a star chart upon its ceiling. 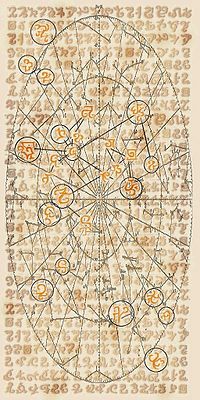 The star chart displays runes for each constellation in a radial grid, clockwise by their associated month. A guardian and its three charges are all found at the same distance from the center of the galaxy. The pre-Redguard Yokudan culture in particular was noted for its astrologers, who would make crude sand maps in their camps. 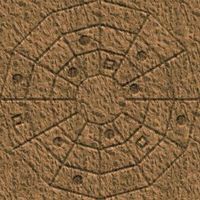 These are identical to the Dwemer star charts in their radial configuration of the constellations. The only difference at all is the simplification of guardian runes to outlined squares and charge runes to filled circles. 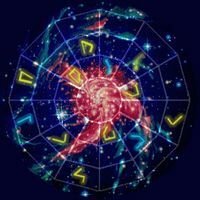 Finally, the Elder Scrolls themselves would seem to depict some sort of star map, with various glyphs of unknown purpose adorning both the foreground and background. Upon careful examination of the particular Elder Scroll depicted here, one can see an outline of The Thief constellation; this is highly appropriate, as this particular Elder Scroll was stolen from the Imperial Palace and used to break the curse on the Cowl of Nocturnal. 1.Masser is clearly a color-modified version of real-life photos of Mars. Secunda's real-life base is less clear-cut but it might be based on Triton, the largest moon of Neptune.